Even though I feel I’ve written ad nauseum about my unsuccessful search for disability suitable housing, I realised this morning that many people still don’t “get it” – and that includes those who hold Ministerial positions within our government. What better time than now to try and explain, one more time, exactly what is involved and needed for a person that is severely disabled with profound care needs, such as my son Brendan Bjorn. HAP – the majority of landlords don’t want to get involved with it. HAP – it doesn’t cover the full cost of rent when considering the type and size of house required for a severely disabled person with profound care needs. Renting is a short term solution to a long term need. Pardon me, a right. Renting a house does not provide security. A vulnerable family such as mine could be given notice to vacate after a 12 month lease, thus back at the impossible task of trying to locate – and secure – a suitable rental house…yet again. Homelessness is highly likely in this scenario. Renting someone else’s home does not allow the family to avail of any home modification grants. But even more importantly, it means the family cannot modify the home to safely and properly care for the disabled family member. There are many, many other aspects to this situation that could be addressed, but for the sake of this article, I’ll just demonstrate with one more photo. If a family with a disabled child is fortunate enough to own their own home, there are grants for modifications. Even so, families have had to fundraise to cover full costs of modifications…but at least they have that opportunity. If a family with a disabled child is fortunate enough to have a suitable home via county council social housing, the council can/will make the necessary modifications to meet the care requirements of the disabled family member. But if a family with a disabled child is left to the private rental market, they are left at tremendous risk of homelessness. If not homelessness, they are more than likely forced to settle renting an unsuitable, unsafe house (as the photo above demonstrates). No chance for required modifications. No safety for either the disabled family member or the carer. Is this really what we want for the most vulnerable members in our society? I ask, but I’m nearly afraid to hear the answer from those who have the power. This morning I started my day with the typical cup of coffee while perusing social media. What wasn’t typical, though, was to discover a comment left on one of my blogs addressing the difficulty in finding suitable housing when faced with the requirements that come along with severe disability and profound medical care needs. Even now, as I re-read that question over and over, I somehow can’t fully wrap my mind around it. That initial smack in my face continues to sting even hours after the first reading. There are some things that people should never, ever, say to a parent of a child with a disability and/or a life-limiting condition. This is one of them. When is he going to die? He doesn’t have any quality of life so really it would be better for all of you if he passed away sooner rather than later. Some of those above comments were made by family members. The impact is tenfold considering the source. When it comes from a stranger, you can nearly forgive and forget – but still, the sting of that initial smack lingers as it intertwines with the heartache that a parent like me carries, hidden in the deep recesses of our soul, daily. Here’s the deal: Don’t say those things, ever. Don’t suggest that we place our disabled children anywhere else but home. If we want to, we will, but it is not anyone else’s place to suggest such a decision should be made. Our disabled children are our children. Get that? They are not something that we could – or would – readily dispose of like yesterday’s newspaper. Again, they are our children. Disability does not equal disposable. This journey is hard enough having to fight the system and the government for equality, fairness, specially required exceptional services (ie: disability suitable housing), much needed respite care, medical appointments and operations to be done in a timely manner, and so very much more. This journey is hard enough when fighting the system and the government, that we are made to feel like our children are unworthy – if not even disposable in their view – so the last thing we need is personal commentary from family, friends, or social media followers suggesting the same. First come first serve vs. priority. What’s fair in the world of disability? There was a house for rent last week that would have worked for Brendan Bjorn’s needs. There was a 2nd sitting room on the ground floor which could have been his bedroom. And while the house was furnished (we need unfurnished because of all his medical equipment and supplies), it could have worked. Not ideal, but again, we definitely could have made it work. I learned in an email after the house had been let, that the owner and his wife had heard of our story and very kindly wished us the best in finding a home. But – and this is the crux of this current piece – they felt the fair thing to do was to rent it on a first come, first serve basis. Part of me can understand that train of thought. In many aspects of life, that philosophy works. When you go to get a coffee at the local shop, you wait your turn in the queue. When you enter the drive through at McDonald’s with your kids, it’s first come first serve. I get it. But when it comes to the special, and often complex, needs of the disabled, applying the first come, first serve ideal usually doesn’t work. There is a reason the disabled parking spots are closest to the store. When it comes to people who are disabled and have complex, medically fragile needs, there is a reason they are (or should be) placed at the very top of waiting lists, be it housing or medical – because their very life can depend on that service NOT being first come, first serve. Think triage in a hospital ED. Those most in need get seen to first. Why? Because THAT is fair. Look, I certainly understand that life is not fair. I will, after all, one day lose my first born child. So, no, life is definitely not fair. I challenge you, dear reader, to consider where in the sand that fairness line should be drawn. Do we relinquish the idea that those most in need, those with medical fragility or disability, should be tended to first? Do we take away the parking places closest to the store and just let people with disability park where they may despite the hardship it would undoubtedly cause? And should we apply the first come, first serve mindset in housing too, be it rental or social housing? A point to contemplate: If the answer to this last question is yes, it means the most vulnerable people in our society are being left to fight for a place to call home amongst the thousands of other people who are also searching for a home – but those people can actually fight amongst the crowd. THAT is the difference between equal and fair. I ask you, what is most fair in this often tragically unfair world of ours? Sometimes, it only takes one sentence to encapsulate one’s current life situation. Sometimes, it only takes one sentence to tell of a child’s innocent worry. Sometimes, it only takes the start of the sentence. Sometimes, it only takes one sentence to cut like a knife. Sometimes, it only takes one sentence to demonstrate the embarrassment of a 9 year old child. Sometimes, it only takes one sentence – never before said – to convey underlying heartbreak. Sometimes, it only takes one sentence to express the inexpressible fear and turmoil in child. Sometimes, it only takes one sentence to shout out the life-changing, detrimental effects pending homelessness is causing. And sometimes, just sometimes, it only takes one sentence to provide much needed reassurance. It’s only 25 days until Brendan Bjorn turns 13! Once I got past the dismay in myself forgetting this tremendously important milestone for my first born child, I began instead to think about what the day, October 1st, will mean. Well, for me, it will mean nothing short of a miracle. If you had asked me this time last year, I would have said chances are Brendan wouldn’t see 13. His health was in that serious of a decline. But here we are, thankfully now able to count down in days to the special birthday when he will become a TEENAGER! This amazingly gentle, fragile child who has shown his indomitable spirit time and time again, is going to be a teenager. I am truly overcome with emotion as I sit here writing this in the quiet of the night. 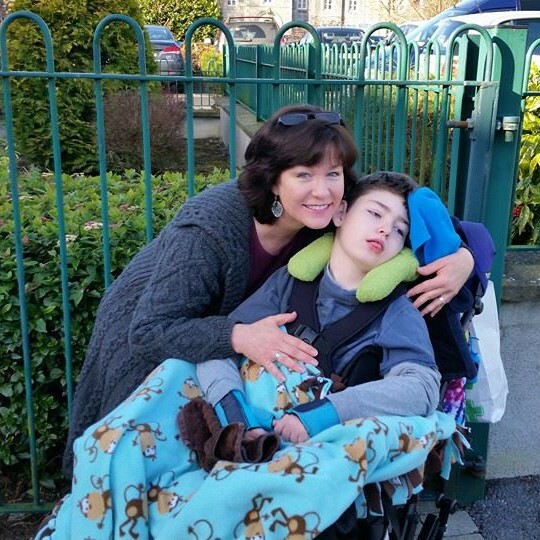 When you are on this journey with a child who has such a precarious life-limiting condition, each day you have is one that you couldn’t count on having. It is also 25 days until my little family find ourselves living somewhere other than where we currently are, although where we will be is completely unknown. We face homelessness and may very well end up having no choice but going to live in a hotel. Now there is a sentence I never thought I would write about myself. As I finished giving Brendan Bjorn his medications earlier tonight, my thoughts went from his birthday to where will we be for his birthday? Will he be safe? Will we be in a home? Or will we be in a hotel, him in a flat hotel bed without a specialised pressure relieving mattress, his health…his life…then put in serious jeopardy? My heart sank. My joy at his milestone birthday disappeared as quickly as it came. This journey with Brendan Bjorn has taught me that one day can completely change a person’s entire life. This journey has also taught me that you can never be sure what is going to happen from one day to the next. So, with this journey’s learnings, I can only hope that these next 25 days will change our 3 lives for the better, not for the worse. I can only hope that come Brendan’s milestone 13th birthday, we are safe, secure, and happily together in what will be our long-term family home. Only 25 more days until October 1st.